Merry Christmas! Putang Ina Mo! At the end of the year of the Lord 2016, we find ourselves in a divided world. This bifurcated world is reflected in the title. On one side, we have the old world of tradition, of civility and of — dare I say? — gentleness and kindness. On the other side, we have the new world of change, of incivility and of — I dare say — brutality and insanity. This month last year, we were munching popcorn with our favorite drink at hand. We were on the edge of our seats with excitement, entertained by the political comings and goings in the presidential campaign of Election 2016. Do you remember how it was? Early in the month, Grace Poe was disqualified (DQ) by the Comelec. Miriam Santiago was topping university polls. And the Comelec had not made a decision on the substitution of one Rodrigo Duterte for another candidate. In the non-political and not-so-political sphere, the Supreme Court had granted Gloria Arroyo, adorned with neck brace, a Christmas and New Year furlough; German Chancellor Angela Merkel was named Time’s Person of the Year; the “tanim-bala” racket was causing much anger and grief; and President Aquino suspended military operations against the NPA. Oh, yes, and typhoon Nona was raining cats and dogs. Toward the end of the month, Poe had lost the bid to reverse the DQ ruling and in desperation had turned to an exhumation process. Thirteen were killed in staged attacks by the BIFF to show they were still a force to reckon with, and 8 were killed in an Abu Sayyaf clash with the army. In the whirl and glamor of showbiz society, Pia Wurtzbach won the Miss Universe title; and, at the other extreme in the underbelly of society, a manhunt operation was launched to find a Bilibid escapee. And, oh, yes Kanlaon volcano spewed ashes, perhaps to show that she too was a force to reckon with. It seems the themes that predominated in December 2015 were: political wranglings, judicial wranglings, insurgency/bandit/army wranglings, natural catastrophes, and beauty pageant wranglings. Now, I ask, has anything changed? Well, yes and no. In a way, things have changed to remain the same. No, sorry, that’s not right. Things have changed to become worse. I have a dreadful sense of deja vu. The dark horse, Rodrigo Duterte, won by more than a pockmarked nose. The once moribund NPA is in peace talks with the government and has lately developed new muscle and acquired increasing relevance. Gloria Arroyo, bereft of the charmed neck brace, was released and is now engaged in power plays. She managed to have her grandson released from illegal drug charges. Grace Poe retained her Senate seat thanks to the Supreme Court. Donald Trump won the US presidency and was named Time’s Person of the Year. Ferdinand Marcos was sneakily reburied. The Abu Sayyaf remains resurgent after allegedly receiving massive ransom amounts. There is a new terror group, the Maute gang, which has connections with ISIS. Tropical depression Marce raised a yellow alert. Leni Robredo resigned from Cabinet after being treated uncivilly. And Bongbong Marcos continues seeking to replace her in nefarious ways. What has been a radical change, unspeakably dark, and unspeakably vast, is that 6,000 lives have been snuffed out in the space of 6 months. And there is no end in sight. I have often thought that good and evil are twin undercurrents of the River of Life, which finds its source in God. He allows us to teach ourselves with the lessons of love or of suffering. I am not sure Aeschylus is totally right. He is right in that suffering is often the price we pay for wisdom but I reject the notion we must continuously suffer to learn. We can learn through ratiocination and projection, through the proper assessment of past wrongs and sufferings. What I know is that we are offered the choice between a redeeming grace and an awful grace. In our ignorance, anger, and arrogance, many of us blindly choose the awful grace. And rather than sacrificing for others as Jesus did, we readily sacrifice others for self. I know that many possess Christ consciousness and would follow in His footsteps. You wish that this world were not so divided between love and hatred. And you mourn for the lost lives. For the lives still to be lost. For the holy infants. And you pray and hope for peace and goodwill toward all men. All men. Happy New Year! And a Merry Christmas! But I am not superstitious, so the old formulation should work. Just lose the curse, okay? Profanity is blasphemy. What is important, I think, is to be aware that when you offer the greeting “Merry Christmas,” you truly understand what Christ embodies. Do not simply honor Him with your lips. You must honor Him with your heart, thoughts, and actions. San Amagan.. said the Yanks recovering Manila in 1945..
and a number of Filipinos wondered about that saint..
Now they ask who is san amabitch? Duterte said it was Obama. Ha ha, my aunties all of whom have died, they would have been in their nineties now, used that expletive when they hear news that involve erring ‘bastards’ like the men who gang raped raped Maggie de la Riva, Marcos, etc. Duterte would have been on the firing line had they been alive now. 1. Dysphemism. Intentional usage to elicit a strong emotion. The opposite of euphemism. 2. Abusive Swearing. To abuse, intimidate or insult others. 3. Idiomatic Swearing. To grab attention, to show off, to assert coolness. 4. Emphatic Swearing. To emphasize something with swearing. 5. Cathartic Swearing. To purge pain. Your aunties would have used expletives primarily under #2 and secondarily under #5. I think Duterte uses expletives under #2 (re Obama. the EU, and persistent journalists) and #3. The use of #4 is double-edged. Expletives lose their force with familiarity. I can understand #5, especially when one stubs a toe against the furniture. 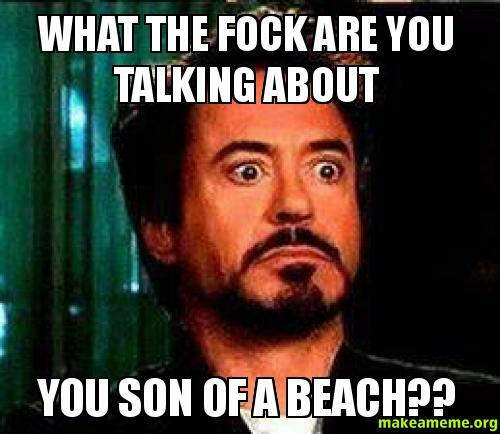 To those who are not used to swearing, in thought and in deed, expletives hurt the ears. Is it a matter of intelligence? No, I don’t think so. Is it a matter of refinement? Perhaps. One thing is for certain: cursing should not be practiced at the level of national and diplomatic affairs. My son went home crying when he was called bobo together with all his bus mates by a busmate having a bad hair day. I told him just think she said all of you were stupid. Incidentally, my use of the expletive in the title was dysphemistic (#1). By concatenating and juxtaposing the most joyous greeting in Christendom — that is, besides “Happy Birthday!” — with the grossest of visceral insults, I intended to clearly show the two halves of our divided world… and to make readers recoil in disgust. And the target of the disgust was intended to be the President who has “normalized” the profanity to the point that 16M or so Catholic voters accepted its abusive use (#2) not only against the leader of the Free World but also against the leader of their Church. And, judging from the results of surveys, many not only accept but continue to approve the President’s use of such language. Yeah, accept may also mean there is nothing we can do about, so grin,bear and deal then play poker. Before November 2016, we were worried of a Binay presidency. Holy Infant so tender and mild..
sing the aswangs that roam Manila. The pose of the body is reminiscent of some sculptures of Christ’s crucifiction. The position of the legs especially, and the baring of the mid-torso. Calling Manong NHerrera to parse these stats from SWS. 8 out of 10 are worried about EJKs but somehow, 8.5 out of 10 also are satisfied with the war on drugs? I guess one can be worried about the killings and be satisfied with the outcome of the war on drugs at the same time? That is such a complicated feeling of guilt and elation, in my opinion. I guess this survey mimics the title of this blog. Elation about His birth in the first sentence and blasphemy in the next one. NY-based author Ninotchka Rosca calls these times the Reign of the Tikbalang. Ang tawag sa lalaking manananggal ay abogado. I hope everything is alright with Manong. The Society of Honor is an Oasis, one of the few remaining green spot in this desert where one gets rational discussions and sustenance. Keep up the good work guys and gals. Thanks for your oasis of a blog, Joe, and the many friends who let it stay green and maintain a well of sustaining water. Juana: before these days the results of the SWS survey of EJKs among Filipinos may have raised questions of inconsistencies than they do now. Post election campaign and election of both Duterte and Trump, the inconsistency is gone with Dear Leaders Duterte and Trump displaying the NewSpeak of what we thought are only in the World of Orwell’s 1984 novel or the world of Stalin. 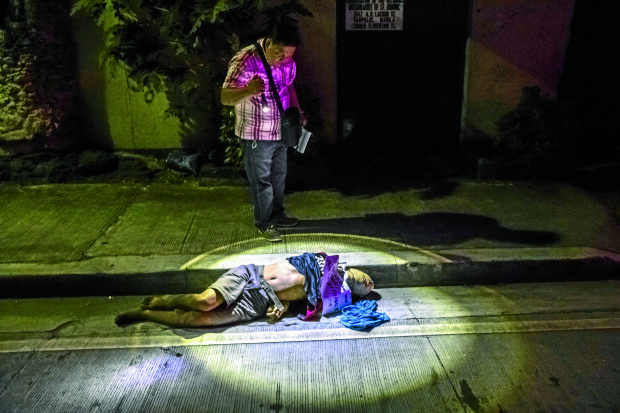 To be charitable, to the SWS survey participants, it may be their way of expressing approval of the concept of the war on drugs but not the method — EJKs. Besides the Survey format does not allow for explanation — only the filling-in of blanks. Merry Christmas, Juana. edgar, karl: still here, but pre-occupied lately with balikbayan relatives and friends. Keeping up on the reading of TSH blogs and discussions, though. Nicely composed blog article, edgar, as always. And Merry Christmas and PIM (the latter, my form of endearment. 🙂 ) to both of you. Best wishes to you, as well, good friend of so many. Celebrate well, live well in ’17! – so complex yet so simple. I always contend that we are living in an era where a survey respondent is unlikely to have the courage to say NO if asked in public “Are you satisfied with the prez?”. Next time surveys will be done via secret ballot. Best wishes, manong NH! Merry Christmas to you, and yours and TSH! Ahaha! You have become an Aussie! Merry Christmas and a prosperous New Year to you and your family, Manong. Always glad to hear your say about the survey results. Aleppo. This is what happens when a regime suppresses dissent by force. What is happening here is that the regime is suppressing “criminality” by force without regard to due process. We should pray we do not reach the catastrophe that is Aleppo. Yes…Call me fanciful, but I have this notion that what is happening in Aleppo is one of the testing grounds for humankind. Same thing with the Filipinos with regard to Duterte and his unsavoury actions (EJK sanctions; going winky-winky with China and Russia; support for the Marcos Orcs, etc.) I used to feel that we are beginning to pull ourselves out of the murkiness begun by Duterte. Now, it’s 50-50, with a good chance that we can still submerge ourselves. His face may not be plastered across our country, but on the TV screens and news headlines as though he is Big Brother, as he now challenges anyone who criticizes his reign. In early January, there will be a performance review of the President’s first six months measured against his original campaign promises. In the spirit of the Season, the nation should give him time to fulfill some of these. Come January, there will be a time of assessment and accounting. Who took the BEFORE weight of the fishies and who will take the AFTER weight in January? 🙂 (My morbid humor surfacing again). I think a president is duty bound to tell us even if he has a cold. So here I am, no longer quite the fearful child but instead a disheartened grown-up pondering on how we might perhaps be quite undeserving of Christmas this year. But there’s always second chances. There is always a way to make things right, if we try hard enough. Maybe some of us will aspire towards that in the new year up ahead. So here’s to a happy-er new year for us all, with a few less tears and many more reasons to smile and believe in each other’s goodness once again. Ah, now, you are among the first to speak of the bright half of the divided world. We are so disheartened that it is the dark side that we focus on. If you were a strange kid, I might have been stranger. Instead of worrying about postponing Christmas, I thought Christmas should occur, if not daily, then on a more frequent basis. Then I would have goodies year round! As an adult, I think the spirit of Christmas should be daily. Not the gift-giving obviously as that would be prohibitively expensive, but the spirit of cheer and goodwill. We don’t have to be fools for Christ and give away all our possessions or become ascetics. But a consideration of others in all that we say and do should be a great start. Being fools for others. Not taking advantage. Not palakasan. Then we might truly become a land of happy fools. Indeed, happy new year to all of us. Well, we know this darkest trial will pass but it may be for the worst. It’s a difficult question what one must do. The Bible is ambiguous about resistance. There are passages to turn the other cheek and to accept subjection to governing authorities. But there are passages that encourage resistance as well. In political philosophy, the right to speak out, resist, rebel or even overthrow a government (or ruler) that acts against the common interests is widely recognized. We also have the mechanism of impeachment. I am speaking in general terms, but specifically, the administration is carrying out state-sponsored violence against drug personalities, has set aside the UN tribunal ruling on the West Philippine Sea, and the President has personally boasted of killing suspects. Arguably, all of these are unconstitutional. Currently, however, the president and his regime have popular and institutional support. Personally, I would seek to develop a warrior spirit to overcome apathy or despair. (I would point to the Villanueva family — Renee, Will, daughters, and dogs — as an example.) Again, this is easy for me to say not being directly in harm’s way. But if there is a need to push back, then I feel one must push back. Thank you ! Happy holidays to the TSH family :)! Sa vogue ready to drop dead georgeous is apt for this film. This is why I cling to Christmas to tell me not everything is lost. 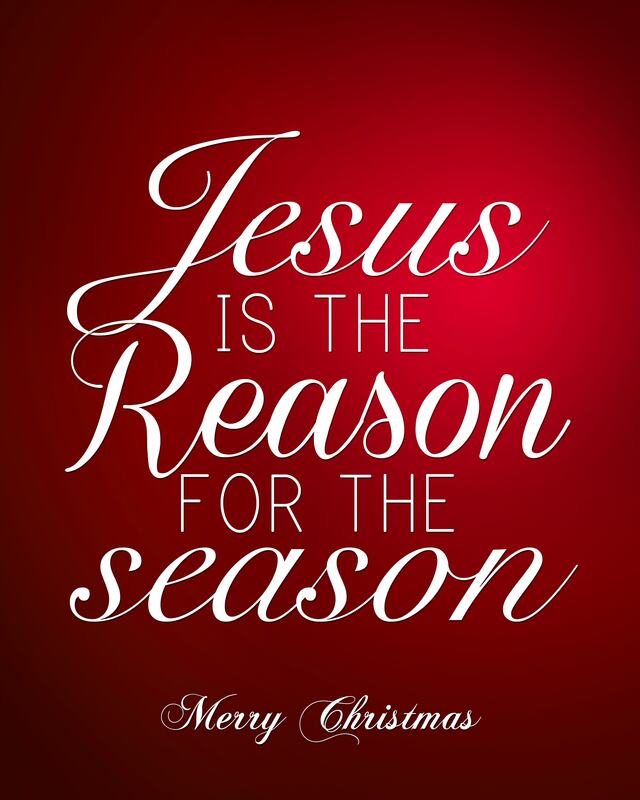 A blessed Christmas everyone! To all of us here at TSH! The presumption is that God sets the boundaries of our behavior and that there are penalties for any transgression and rewards for obedience. This is reliance on an external force. Intersubjectively, at various levels — international, national, church, and family — we create laws and rules to set the boundaries. There are penalties for disobedience of the law but generally no reward for obedience. The reward is social in the maintenance of peace and order. This is reliance on institutional force. Subjectively, we may or may not set rules for ourselves. If we do, the rules may originate from the state, our religion, or our culture. Beyond these, we may create personal rules. There is the penalty of guilt for disobedience, and there is the reward of a clean conscience. This is reliance on subjective force. So, in a sense, not everything is permitted either intersubjectively or subjectively. Morality, ethics, can exist independent of God. The little voice of conscience can be stronger than threats of Hell. But it is good to belong to a religion which sets the belief and the practice that we are here for a reason, that gives us an intrinsic purpose. That purpose generally is to live for others and not just for ourselves. For many Filipinos: ‘if Duterte does not exist, everything is permitted’. Church, institutions, nation were only obeyed pro forma over centuries. Family has broken down for many, so an external father figure comes in..
Filipino families, among the poor, are often a wreck. Yet they anchor everything. Go figure. Very true observation. Most Filipinos require an external force to become obedient because morality has not been internalized. This is true for the Chinese as well, but not for the Japanese. One sees how unChristian we are at all levels of society, and in all branches of government. And in the Church. Thank you for those two links. On the second, the taxonomy is hierarchical but a person does not have to necessarily progress through each level. I think this statement, “Finally people will vote for the candidate who is at the stage they are themselves,” is spot on. We are mostly NOT independent free men. Our stage is one of psychological serfdom or vassalage. We need a God-King, a Padrino, a mistah. All of these figures misdirect our loyalty to themselves and detract from our love of country. Joe, edgar, Irineo, Karl, Juana (w/hubby and the little one with the ‘fishies’, Cha, Mary Grace, chempo, NH and all purveyors of peace and sanity in the TSH I wished you all blessings of the Infant Savior and Mother at my Simbang Gabi Masses in our Chicago -3 F cold and snow. (No let up in sight till after Christmas Day). The Salu-salo after Mass and the smiles of people of good will – priceless. And yes, a prayer of remembrance to our EJK victims and strength for the rescuers (the White Hats brigade of Aleppo). Inspite of the pain and suffering, ad Deum omnis honor et gloria!! 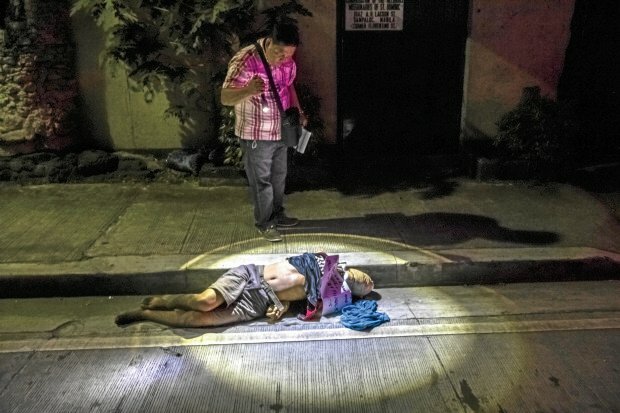 The closest to White Helmets we have in Manila are them, the night shift, the death beat: I don’t go every night. Twice a week at most. The other men and women in this picture cover death nightly. They are occasionally morbid, occasionally cynical, often in the crossfire of exasperated parents and partners – “You’re missing Christmas?” Every one of them remains some of the bravest and most compassionate journalists I have met. The fact of our working for different houses doesn’t matter – nobody gets left behind, particularly under the watch of Inquirer’s Raffy Lerma. I am told that people who do what we do are always damaged, one way or the other. I am also told that if you’re very lucky, and I am, you find yourself part of a tribe – welcomed among journalists who require no explanation and understand that once in a while, maybe once in six months, it is necessary to tell bad jokes and worse stories, to stuff yourselves full of beer and chicken and pig and cheese, and to pretend, for a night, that the world is functioning as it should. My first thought was: they can still smile. My second was: they have to smile. Something like Juana’s morbid humor. They surely suffer trauma, like soldiers in war. What saves them from mental derangement is that they are observers and recorders, not actors. But even so, the horror and the insanity — the absurdity — must get to them. They use their art as catharsis. I think it is very hard to be exposed to that degree and reality of violence on a daily basis and retain faith in man’s humanity. There are two directions: one can become hardened, inured, or one can become more compassionate. you have the addicts who will do abominable things to neighbors..
and neighbors who rejoice in their deaths – innocent victims included..
the rich pass by in cars and are behind walls, couldn’t care less about it all. Merry Christmas to you, sonny, and best wishes for the new year. Fill’er up! Will do, mon frere! 🙂 Noel! – from the other side. Merry Christmas! The promise of Christ is that every soul is redeemable. Last year at this time, whilst there was glooming outlook on the looming election, there were cheers on the economic front. We kept our fingers crossed for a new admin that can build on the economic gains and bring the country to a new level of progress and prosperity. Whilst we could see the light at the end of the tunnel, we slipped and slidded away. We are at risk of being branded a coprolalian nation. Heck, a country gone berserk with killings would even wear that as a badge of honour, as the word shame and decency is deleted from Filipino dictionary. No less than a 1969 SC ruling have been used to defend the prez’s casual use of putang ina mo. So said justice Makalintal then in the case of Rosauro Reyes – it is a common term, and in no way can be construed as having intent to defame or threat. In other words, the person who uttered those words is not going after you mother, so cool it lang. The past six months have been a race to the bottom in civility and morals. I can end the year wishing everyone here a Merry Xmas and a Happy New Year, and I’ll go to church comforted in the thought that I am not one of those sycophants supporting killings, thieves, liars, and so I embrace holy communion with love and not deception. As always, you are a voice of sanity, rationality, and politeness. To the LIGHT BRINGERS at TSH (especially Joe, the Switch, and the LED bulbs in Edgar, Karl, Chemrock, Sonny, Francis, N. Herera, Irineo, Juana P. n Josephivo), I wish you plenty of Merry Christmases and many, many years of personal wellbeing ahead. Thank you so much for the wisdom, info, and wit in your comments that you so consistently share. Long live with the Force in you! LG, Merry Christmas to you. Doesn’t LG mean light giver? Thank you Sir… as always TSH is the best site, really with “de calidad” members. Wish to hear from Andy Ibay too. Hope he comes back. Full reprint of a Christmas Story by Philippines Graphic editor-in-chief Joel Pablo Salud… posted on Facebook just days ago, and very relevant to today..
Christmas, they say, is about family. Yes, it is to some extent. It was about this one particular family who lived under brutal imperial rule, one whose foreign emperor was as ruthless as they come, and was worshiped as a matter of political expediency. The people’s local king was just as ruthless, maybe even more, having been half-Hebrew, and to the fullest reaches of unscrupulousness, a traitor for surrendering his allegiance to a foreign power. It was about a lowly Jewish mother who gave birth to a wanted man even while the child was yet in the womb, so much so that their king ordered the mass extermination of two-year-old male children and younger just to see the child dead. The reason: all because it was predicted that the child would rise to power and carry the same title as the monarch should the prediction come true: the King of the Jews. It was about a child whose birth forced heaven and earth to conspire toward his death–death by the severest form of capital punishment–crucifixion–and via the betrayal of one of his closest friends. At his execution, he was placed in the middle of two thieves–the guiltless dying with the guilty. And yet in all this the child proved himself innocent of any crime except that he loved humanity–warts and all. Yes, the first Christmas told the story of an injustice so severe, so unimaginable, it had nothing at all to do with snow or cute little elves, chestnuts or jingling bells. And though believers say it may have been necessary for this child to die the most excruciating death as a matter of destiny, he remains by all measures a victim of religious and political malfeasance, the sort that was to mark humanity’s existence for centuries to come. It matters little whether you believe in the story or not. That the tale was told already tells us of humanity’s condition. Love, it seems, remains a crime to all those obsessed with power. They will stop at nothing to destroy it. The good news is, evil can heap its worst, but no amount of brutality will keep those who hold fast to the faith from rising out of what the ruthless believe is love’s defeat. Let’s not forget the true Christmas message. Happy holidays, peeps! See you in 2017. BTW, speaking of Germany, they’re taking the first step against fake news. I am not a Christian, like I suspect most Australians now..But here In Australia a secular or at least non religious, version of Christmas is being re-enacted.. In this reenactment the focus is on children and family; on secretly buying & giving presents especially to children while simultaneously pretending that they are ‘given’ by a jovial & eternal ( = semi divine ? ) Father Christmas. Where does this originate ? While there is some ( a little) overlap with the nativity story and the gifts of the magi. But I do not think this is the origin. It is interesting that Christmas started as a Christian celebration only after Constantine & his successors forcibly christianised the Roman empire after 325 AD. Before that Christians were appalled and hostile to the Roman feast of Saturnalia which had similar gift giving, & took place at the same time in the yearly calendar. But after the forced Christianisation, the church incorporated and altered the Roman festival into it’s annual festivals.. But I diverge ! Too much history can be annoying ! In Christmas the real continuing thread is the offering of gifts to the innocent, our children as an expression of our care and love, without our young children knowing that we are the givers…Thus it is all about giving with the expectation of anything in return..In this context the nativity story can serve to ennoble us all. A final divergent thought : The Philippines as a nation are plunging into a time of crisis & sorrow. In some strands of Buddhism it is said that the Chakravartin, the Buddha reincarnated again. will whenever the ‘world’ is in crisis, be born again in this world as a baby. In all these ideas message lies hope. Bill in Oz, thank you for reinforcing the Christmas message. Spreading the message is lighting a candle in the dark. We all have seen pictures of flickering lights in a sea of darkness. Indeed, this brings hope. The protestants in the 17 century didn’t like the worship of Saints but could not suppress the Sinterklaas tradition only moved the celebration to X-mas a more acceptable holyday. The Dutch protestants brought Sinterklaas to New York where he became Santa Claus. And the American commercial genius made X-mas what it is today. To paraphrase Edgar, I wish all Filipinos a lot or X-mas days next year. Josephivo, thank you for that historical footnote. I was not aware that Christmas and Santa were more of a collaborative effort of Catholics and Protestants… and pagans. I was just aware that Christmas day was made to coincide with the last day of the Roman winter solstice festival of Saturnalia. The Spanish don’t give gifts until Three Kings Day, if I remember correctly. Of course the winter solstice is significant – also for the Christmas lighting. Most of Central Europe has around 16 hours of night and only 8 hours of day this time of the year, so the bright lights in the cold night make it less gloomy. Go up to Stockholm and you will have 18 hours of night and just 6 hours of day. It is quite natural that people huddle with their families in such weather. In times before, it was a matter of safety to be in a cozy place. Harvests were stored, livestock in safety, and often winter storms come in the mountains. And here in Oz, tomorrow, Wednesday the 21st, is the summer solstice. The day duration for Brisbane is 13 hours, 52 minutes and 53 seconds. According to this Dan Briown Novel: Angels and Demons, Jesus was born around March. When converting a large number of people, you adjust to their traditions,thus they adopted the Winter solstice because when in Rome, you do as the Romans do. You maybe right,so he reiterated it at Angels and Demons, I just went past that chapter where Langdon is doing his trivia lectures to his companion. and may those of ill-will dream of things that go bump at night. I like the use of the discarded car petrol tanks as drums. And the evil spirits are cute in a Satanic sort of way. It may also be that some, many of us have forsaken Him. A lot of us have mislaid our moral compass. He is around but we ignore His presence. The latest SWS survey validates that. the pilosopongTASYO guy used your grandpa as his gravatar.